Just launching your ecommerce business idea won’t make people buy. Forget about the dreams of customers lining up and sitting with their wallets in hand waiting for you to launch, and crashing your server with traffic. Running an ecommerce business is just as hard as running any other business (minus the soul-killing overheads perhaps). None of the advantages of ecommerce businesses take away the stark reality that entrepreneurship is hard. Your ecommerce business is always going to be a work in progress, but there are small steps you can take to make sure that those who land on your site convert at the highest possible rate. Ecommerce trust drivers – those little tweaks and elements that can help boost conversions and sales, and bring in the profits – take little effort on your end but can do wonders for your store revenue. Here are 15 tweaks you can make to earn trust in your ecommerce site and entice your visitors to buy. Your product: Is it good enough for me to buy? You might not like this, but your products might not be the best out there. If you are good, then you have competition. No one is going to buy from you if your products are not worth it. You’ll be surprised, but most brands, products and businesses are just not up to the mark. We sure hope you don’t fall in this category. But here’s the downer: more than 90% of startups fail. So how do you get around this issue, and make sure that your product will sell? In Pat Flynn’s Will it Fly, he ascertains the importance of paying attention to what clients want. The first step is to create a list of people among all your friends and acquaintances that fit your customer or client profile. When in Drive, click on New > More > Google Forms. Send the survey to them. That’s it. Once they send in their opinions, you will be able to get a clear idea of the problems customers face, what they think about your product and how it could solve their problems. Before you read the rest of the post, let’s just assume your product idea is validated, has enough market demand and is all primed up for launch (with data to prove it). Your product descriptions, web store copy and other content on your website should be easy to read, to understand, to help your customers “feel” something. That “feeling” could even be mild hatred (and that’s still good for you. Apple doesn’t mind that you read and still choose to buy something else). Your customers will only buy when they can connect with your store emotionally. With the kind of copy on many ecommerce stores today, most people can’t skim or understand it, let alone make an “emotional” connection. An iMac is a computer, of all things. Yet, you won’t really see much of all that jargon here. Note: you read benefits. Show some personality. Go make some money. It’s one thing to write web copy and product descriptions without the jargon and other gobbledygook; it’s completely something else to write in a way that creates an emotional bridge between your brand and your customers. Often, it’s easier to write up text that doesn’t have jargon or technicality. But to write in a way that makes you smile, connect and actually buy? Now, that’s something else. Moo.com is a popular online brand that sells custom business cards, flyers and other related products. Too many ecommerce stores tend to go “timid.” It almost feels as if the business doesn’t even want to sell. You might have offers that run all year round, or maybe you have a few offers that are permanent, such as “free shipping.” Your store could have something that’s not easily found with your competition. You can’t miss the free shipping offer with a banner of that size. Plus, it’s specified clearly as to who’s eligible and who’s not. Right under the banner, you can also see a few testimonials (you do know that testimonials should be flaunted, right?). Instead of just saying that you’re running a few deals, it makes sense when you can put up an entire section of “featured products” or “featured deals” with the discounted prices showing already. Trust badges, trust seals, logos of your payment providers, the little secure “lock” icon on the browser – all of these add to the final “trust” factor and can nudge up your customer trust and get them to buy. Don’t even think of setting up an ecommerce store without an SSL certificate (https:// pages). All BigCommerce accounts come with this feature. Beyond that, it pays to add logos, badges and seals to reinforce ecommerce security. While that’s understandable (i.e. you want to make money! ), it won’t work. At least, not as sustainably and predictably as you’d want your sales numbers to be. That’s why it makes sense to attempt getting targeted leads as visitors browse through your online store. Present an option to buy. If they aren’t convinced yet, dare them to try your product by ordering a trial. By doing this, you get leads (which can be converted later if you set up email marketing automation the right way). The part where your customers have to put in their payment information? That’s where the maximum friction lies. This is one of those “checkout optimization” hot spots where you have to provide enough options so that the customers can decide how they’d like to pay. In research done by FuturePay, “lack of payment options” happened to be one of the most commonly cited reasons apart from “lack of free shipping” and the “price” itself that caused customers to abandon carts. PayPal might seem like the obvious choice, but there are considerably better and more robust payment methods available. It might seem obvious, but you’ll be surprised how many ecommerce stores just don’t do this. Brands using BigCommerce to integrate their store with Amazon Pay are seeing HUGE lift. Check it out. I won’t pay for shipping. No way. The solution is simple: provide free shipping. I cannot emphasize this enough. I’ve come across several cases on client websites where cart abandonment rates were sky-high even when the product was sold at the lowest price on the internet, simply because they charged for shipping. Think of the cost of “providing free shipping” as the cost of doing business (and it’s minuscule compared to overheads that a regular retailer has to bear). Here’s a great list of ways you can choose to implement this on your store. Most of your sales will come from new customers (unless you’re a very well-known brand in the ecommerce space). International customers have a little psychological hurdle to cross when they see prices in foreign currencies. This is especially true when the currency you use has a higher exchange value than the user’s local currency. It helps to use Geo IP tracking, automatic redirects to localized stores or displaying currency in your customers’ location. But making customers pick a currency from a drop-down menu is passé too. Instead, have a way to show currency automatically based on where your customers are located. Brands using BigCommerce can set this up under the Store Setup > Currencies tab. You can add in the currencies your store will accept. Those currency exchange rates will be auto-calculated and the customer’s IP address will be used to serve them the currency for their country. 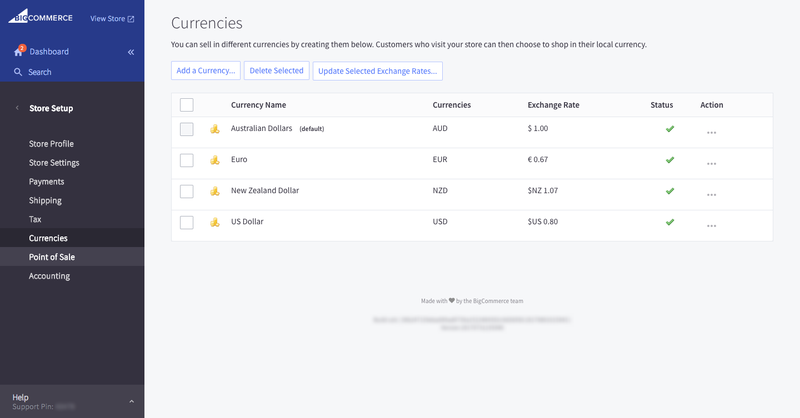 Customers can choose to toggle between currencies as well. According to Aberdeen research, more than 86% of customers revealed that personalization had an impact on their purchasing decision. Many ecommerce stores already miss out on the potent benefits of personalization (the kind that’s possible in regular retail stores). But then, thanks to technology, there are ways to make your customers feel home. For starters, use active methods such as live chat to engage with your visitors. You can, however, do more. Tag potential visitors as leads based on what pages they click, the products they browse and how long they spend on your store. Collect leads and use email marketing automation to segment and nurture leads by being more relevant. Use tools like GrowthFunnel or ConvertFlow to collect leads and prime your new leads by nurturing and pushing them down your funnel. Deploy tools like WebEngage that help you personalize marketing elements such as pop-ups and lead generation forms with your visitors’ or customers’ names. Use Customer Groups to allow VIP customers, or discount-only customers, to sign in and see new products and prices specifically for their buying behavior. When you are ready, you can also try dynamic personalization, web push notifications, app push notifications, SMS marketing and many other ways available to you today. Need more functionality than your BigCommerce store offers out of the box? That’s cool. Browse the best of the best apps on the web for on-click integration to launch your marketing and CX campaigns. As you are reading this, there are a few things happening around you (both online and offline). Your neighborhood mall is running a 50% off sale for the next 5 days. Retail stores run end-of-season sales, and even restaurants have a “Chef’s Special: Today only.” In fact, the billion dollar Cyber Mondays and Black Fridays utilize this very emotion. Amazon runs regular deals (they even have sections on the website dedicated to deals), and all of this is for a reason: a sense of urgency boosts conversions and sales. Marcus Taylor, the founder of VentureHarbor, wrote on ConversionXL about how he increased sales by a whopping 332% by keeping his offers clear, transparent, less distracting and by inducing urgency. If that offer is not going to be out there tomorrow, I’ll want to get it today because of the FOMO (fear of missing out). All landing pages, websites and other web properties make use of call-to-action buttons. You certainly see them on ecommerce stores nowadays – the “Add to Cart,” “Buy Now” and “Shop Now” buttons. Your call-to-action buttons are where all the action happens. These buttons are the last convincing point in your customers’ purchase flow. As such, it’s foolishness to take them for granted. The “Get Started” call-to-action button is already a departure from the usual “Shop Now” that feels like the default option most stores go with (but why?). Click on the button and you’ll land on one of their starter set bundles. Notice that the copy talks in a language that Dollar Shave Club’s Audience (men) understand and relate to. Now the call-to-action button changes to a simple “Select” for a $5 price that’s unbeatable for that entire set of items you get in a single bundle. While this is a good example of using effective copy, visuals and call-to-action buttons, you don’t have to stop here. By using A/B testing (testing two call-to-action buttons, for instance), you can strive to find what color combinations and CTAs work best for your ecommerce store. If your ecommerce store doesn’t load fast enough, you lose sales. Period. But, how important can fast-loading sites be? How about 1.73 billion in lost sales? And that was 5 years back! This might not mean much to you when you start, especially with all the design elements, copy, product images and product descriptions that you need to pay attention to, and the rush of actually setting up and running an ecommerce business. That’s why it’s critical to choose a fast-loading platform like BigCommerce when you look for a hosting solution. Google’s AMP works with some (and soon to be all) of their templates as well. Do your loyal customers have an easy way to let the world know just how awesome you are? With tools like Referral Candy, it’s incredibly easy to set up a referral program in less than a few minutes and then let your existing customers tell their friends, family and everyone else on their social media accounts. For an existing store with any number of customers, implementing a referral program is like giving way to an already very powerful, battle-tested and proven marketing channel: word of mouth. Only this time, it’s automated “word of mouth” at scale. And you have a winning take-off strategy if you incentivize referrals. Which of these 15 tweaks will you undertake to help boost your conversions today, tomorrow, this week? Ecommerce is ever-changing, and no matter your current success, you’ll always be on the lookout for the next best thing. fGet these 15 tactics in place now so you can start pulling in more revenue while you sleep. Catalin is the founder of Ecommerce Platforms, and more recently he launched a free mindfulness app with Zen teachings, and started ethical.net – a collaborative platform for discovering ethical alternatives to mainstream products and services."